Arthi Enterprise is a leading & prominent Bird Net Manufacturers in India. We deal with the finest bird net which are manufactured using high class raw materials. 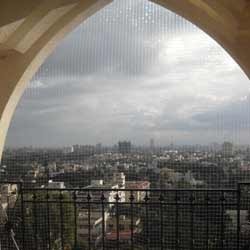 To meet the demands of our esteemed clients, our manufacturers offer the bird nets in customized order. In addition, our bird nets are weaved using quality co-polymer nylon in compliance with the industry standards. Offered products by bird net manufacturers are used for prevents birds from entering to the homes, factories, restaurants, food industries and hotels. Customers can avail our nets in different shapes and sizes. Offered net by our bird net manufacturers is widely appreciated by our valued customers due to its durability, super performance, longer service life and optimum quality. Moreover, our bird net is available at market leading price in accurate time duration. ARTHI ENTERPRISES 501, 5th Floor, Lingapur House, Amrutha Estate, Himayath Nagar, Hyderabad - 500029, Andhra Pradesh, India.